I hope you've all had a lovely Easter weekend! 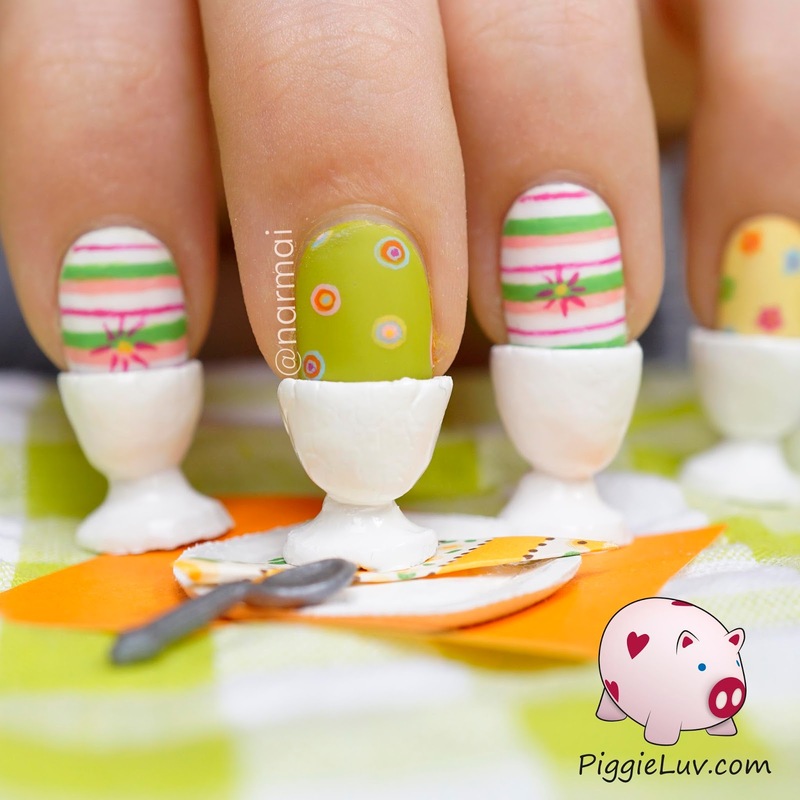 Here are some Easter eggs in their cups, ready to be eaten for breakfast! I know you all love to see how I make these crazy 3D nail art designs so I have a video tutorial as well. Click to see more! 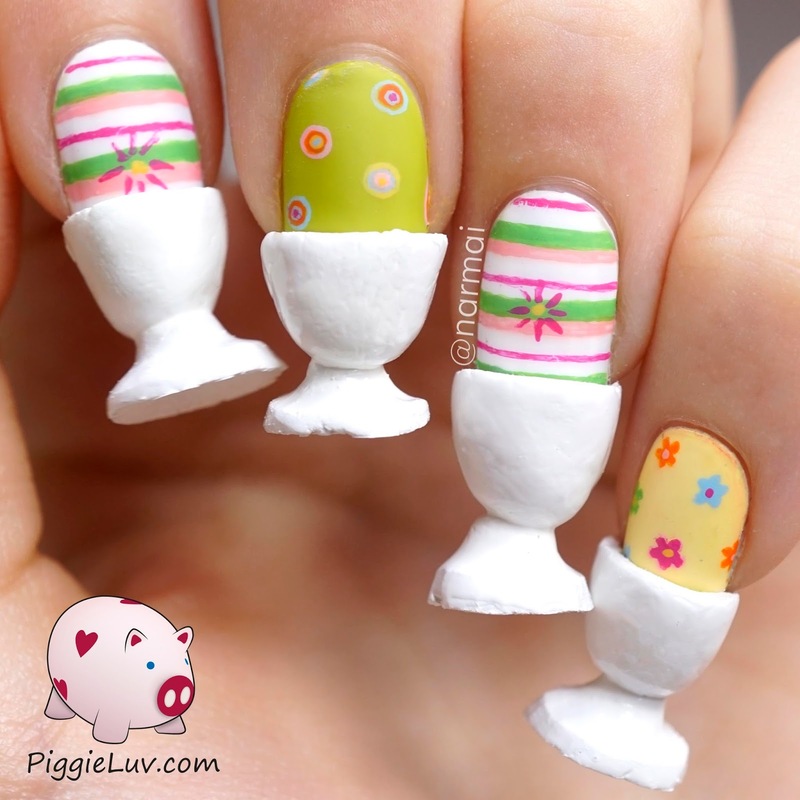 This idea started a while back when I had a colorful gradient on my nails and my mom said it looked like Easter eggs. Ofcourse the wheels in my head started turning and this rolled out of it! I thought I could do a really cheap version using homemade salt dough but that turned into a distaster. I have it on camera so you'll get to laugh about it some time when I post it. After that, I got me some DAS airdrying clay from the toy store. Kind of a waste since I only needed a few small pieces, but when I have an idea, I can't just let it go. It might come in handy though, for other nail art designs. In the video, I'm sanding down my egg cup a little bit using a Dremel handheld multitool. Seriously, if you don't know where to get one of these, then you shouldn't have one. I set it to a low speed so all it does is tickle me when it touches my fingers, but don't mess around with this stuff. I used OPI Alpine Snow for the cup (to make it nice and shiny and cover up the irregularities) as well as the base for the nail art (which was done with acrylic paint and my Basic One Gold detail brush from Christrio Scotland). You see me fixing up the nail with HK Girl top coat and then OPI Matte top coat. Lastly I add some nail foil glue that becomes tacky when it's dry, and then I slide the cup onto my nail and I'm done! These are just for fun, NOT meant for actual wear. So yes, I know they are super impractical. The video is meant for your (and mine) entertainment and not directly meant as a tutorial (although you're welcome to recreate it if you'd like! ).